Many factors influence the relative quality of a root system. This document will focus on three key nutritional factors; phosphorus, calcium, and carbon. Optimum phosphorus nutrition is associated with the quality and quantity of the root system. Natural soil chemistry conditions tend to quickly tie-up conventional phosphate fertilizers into chemical bonds that cannot be assimilated by the plant. Conventional phosphate is often applied in excess to compensate for these undesirable soil chemical reactions. 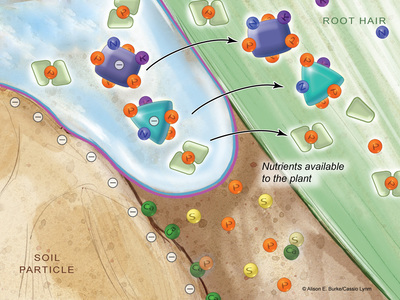 The role of calcium for cell wall strength and integrity in the plant is well understood. However, the very important role that calcium plays in root growth is often overlooked. Inadequate plant available soluble calcium will severely limit root growth. Soluble carbon, or soluble soil humus is critical to proper microbial function in the soil. Adequate microbial activity in the soil directly impacts root development. For optimal root development minimize undesirable phosphorous chemical reactions. Also, promote phosphorus and calcium solubility through improved soil microbiological activity. Last, supplement with plant available calcium where required. Redox has four tools that may be beneficial for improving root development: Mainstay Calcium, Rootex, H-85 and P-58. A reacted plant nutrient high in calcium. Plants efficiently absorb Mainstay Calcium due to the proprietary micro encapsulation technology. Use Mainstay Calcium where increased plant available calcium is required. Apply multiple applications of 0.25 to 1 gallon per acre to the soil during periods of critical calcium requirements as required. 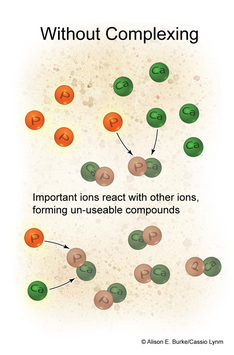 A reacted plant nutrient product high in phosphorus. Rootex stimulates root growth due to the phosphorus and L-amino acid content. Rootex is very efficient due to the complexing process that minimizes negative reactions in the soil which tie-up phosphorous. Apply 1 to 4 pounds per acre to the root zone as required for root development. A reacted plant nutrient product high in potassium and soluble carbon. H-85 improves soil microbial activity due to the short, medium, and long-chain soluble carbon content. Apply 3 to 5 pounds per acre per crop cycle. A reacted plant nutrient product high in phosphorous. P-58 is a very efficient source of phosphorus due to the complexing process which minimizes negatives reactions in the soil which tie-up phosphorous. Soil apply 1 to 3 pounds per acre via foliar application or fertigation as required to maintain adequate P nutrition.